Situated in Karnataka, the marvelous city of Bijapur is famous for a large number of historic marvels that adorn the city. Dating back to 11th century, this city was founded by Chalukya dynasty, who named it as Vijayapura. It was only after the 14th century that it was called as Bijapur after coming under the rule of King Bahamani Sultamani of Gulbarga. In the 15th century, Adil Shah Dynasty took over the city. Different monuments which were created during the period that lies between 11th to 15th centuries, made this city famous among the tourists. 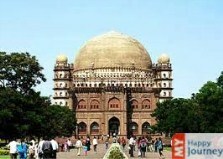 Various attractions that are offered by the city are Gol Gumbaz, Jumma Masjid, Ibrahim Rauza and many more. These are some of the architectural wonders that attract the attention of the travelers. This city boasts of the remnants of prehistoric citadel and forts which give a glimpse of Mughal style of architecture. The rich culture and tradition reflected here leaves its visitors spellbound. Weather of Bijapur remains moderate throughout the year, which makes it a preferred destination for tourists. Travelers can indulge in visiting famous spots that lie in and around the city. A large number of festivals are celebrated throughout the year, which entertain the tourists; therefore they throng the city all around the year. This city still reflects its royal character which tells about various rulers who ruled Bijapur. People who love exploring new places, a visit to Bijapur will offer them an enriching experience as there are many places that lie in the vicinity of the city and can be explored.